Every so often I will do a search of the top brunch restaurants in Toronto. Without fail Aunties and Uncles appears in the Top 5. It seemed inevitable that I would be visiting this establishment to see for myself if in fact the food was as good as the reviews claimed it to be. I am lucky to have great friends who are always willing to accompany me on my explorations to find Toronto’s best brunch establishments. On this day in particular R & S joined me on my visit to Aunties and Uncles. It was quite sunny and approximately 24 degrees. Perfect patio weather I thought. Great for me since I love the sun, but based on the line-up at the restaurant, not everyone wanted to sit in the sun. So my friends and I lined up and waited for a table indoors. There is something about a line-up that increases one’s expectations. I am one of those suckers that lines up to enter a store or restaurant when I see a line of people. Well hey, if there is a line, it must be good! Right?! Well, not necessarily. We finally got a seated after waiting approximately 25 minutes. Not bad I thought. But then again, like I mentioned before, I like the sun. We were seated in a corner in the back of the restaurant and it felt quite cozy. The restaurant did not have air conditioning, but on this day it felt bearable. 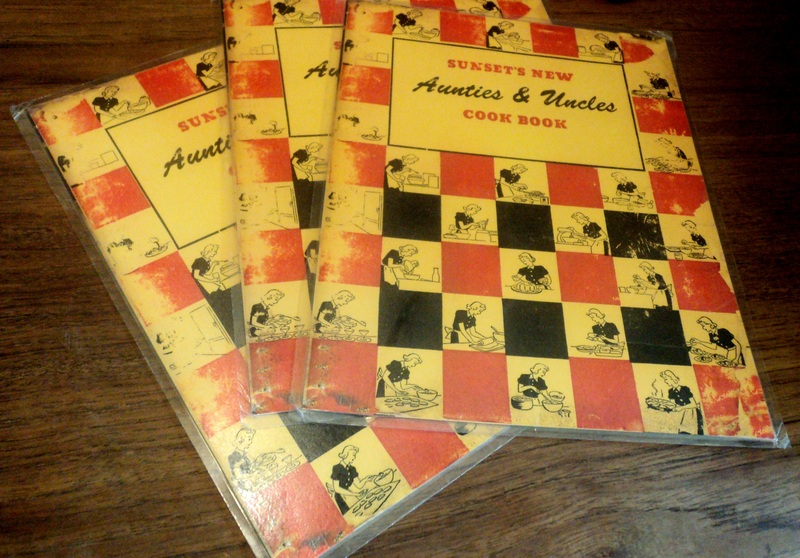 We received our menus which had a 50’s feel to them, and the three of us found the array of options acceptable. Menus. Can also view their menu online. Generally when I go for brunch I like to get a regular portion of a savory dish, but I always find myself craving either some French toast or pancakes. So as usual, I scanned the menu for a side that would satisfy my sweet cravings, but there were no French toast or pancake side options. I was disappointed about that. Not being very adventurous when it comes to brunch (I like the standard bacon and eggs breakfast), I decided to order the eggs (sunny side up), peameal bacon, hash browns, and a toasted bagel with butter for $8.25. R decided to try the Croque Monsieur for $8.25 and I encouraged her to try the potato salad since I had read many reviews noting how incredible it was. I would have tried the potato salad myself, except that I hate onions and there was a chance that there were onions in the mixture. I will never eat anything with onions in it. I did have to double-check with the chef that there were no onions in the hash browns. To my relief there were no onions! S decided to get the eggs as well, except she chose to get challah toast (huge plus for me since I am quite partial to challah bread-large slices of bread with a hint of sweetness-what’s not to love about that?! 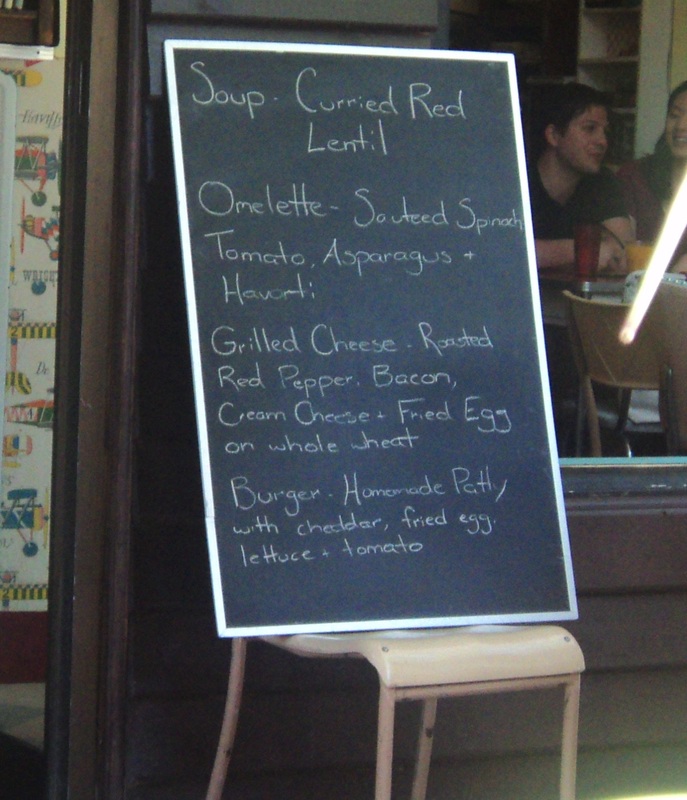 ), and bacon for $8.25. 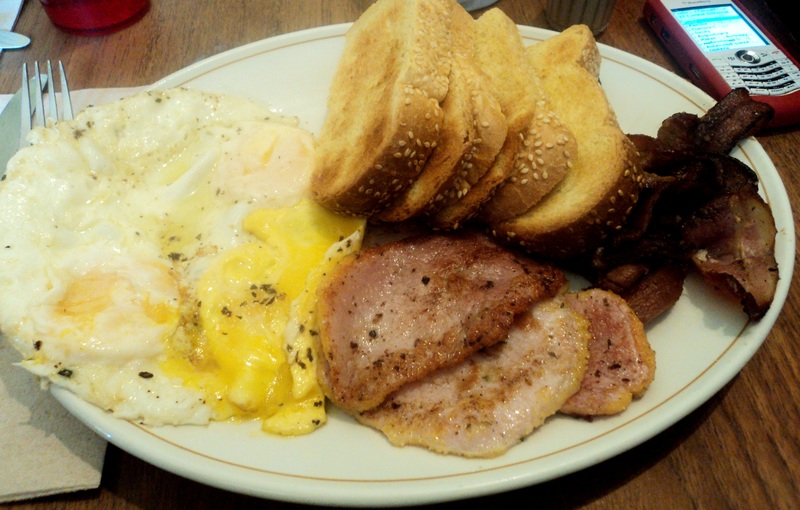 Sunny side up eggs, challah toast, bacon and peameal bacon for $8.25. With our orders in, we chatted and caught up on each others lives as we usually do when having brunch. We did find ourselves trying to get the waiters attention on several occasions for coffee refills. In fact, I had to physically get up and search for our waiter to finally get a refill. It is disappointing when establishments that are successful, overtime lose interest in maintaining high service standards as it seemed to be the case here. 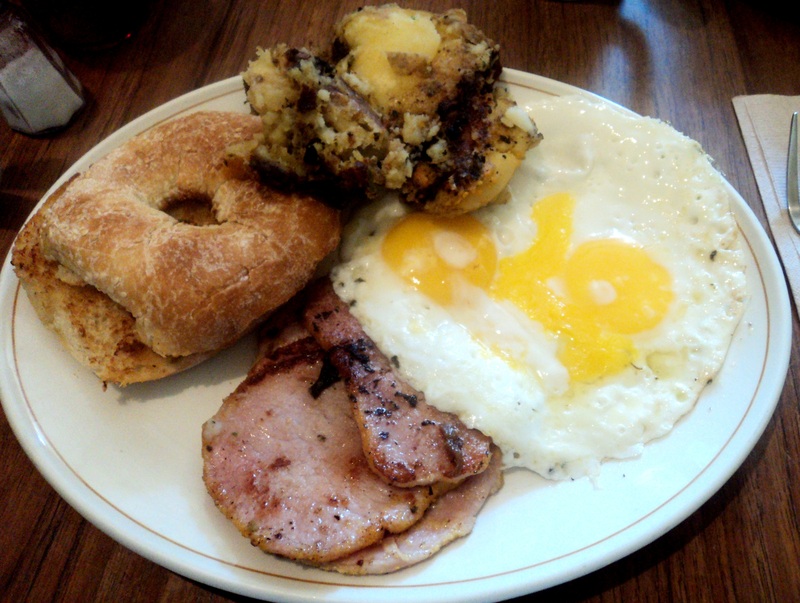 Sunny side up eggs, bagel toasted with butter, peameal bacon and hash browns for $8.25. At the arrival of our food we took a moment to assess it. It seemed necessary considering all the hype this establishment has received. Were we floored? No. But we were satisfied. The portions were decent, the bacon was crispy, though a few minutes longer and it would have been considered burned. The hash browns were a bit of a let-down since what I received was one large piece of potato that was quite bland in the middle. It needed to be cut up into smaller pieces and then fried with at least some salt. My eggs which were meant to be runny were overcooked which prevented me from dipping my bagel in it as usually like to do with my toast and eggs. R seemed quite pleased with her choices, though she did not really agree that the potato salad was the best she ever tasted and S felt this was a decent breakfast. 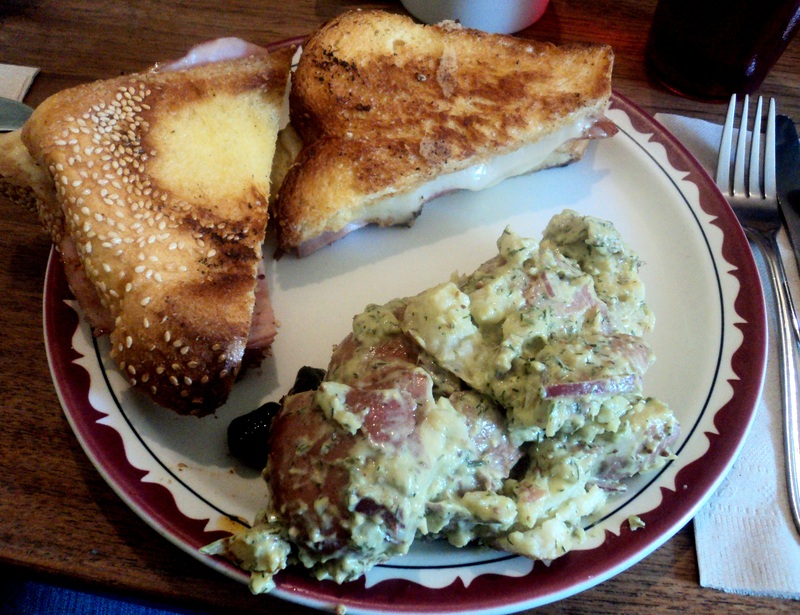 Croque Monsieur (ham and cheese sandwich) with potato salad for $8.25. Was this place worth all the hype? No. 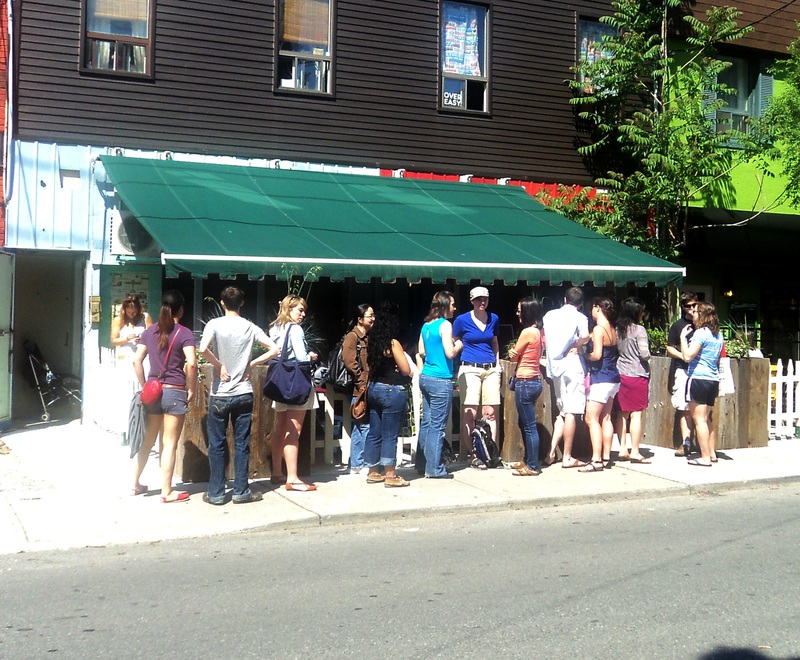 We agreed that we would certainly not be willing to line-up again for 25 minutes for the food and service we received. If we are going to line-up for food, we expect good service and some wow factors in the food we receive. Don’t get me wrong, I love simple food, but I like simple and tasty, minus the “diva-esque” attitude. Boo! I’ve only been there once and loved it – but that was a few years ago, hope their quality isn’t slipping! My sincere apologies for the late response. Thank you for your message! Well, I only visited once, and based on the reviews I have read, it seems that my perspective is not common. :) Are there other brunch restaurants you would recommend? The East Ender at Queen and Leslie!!! 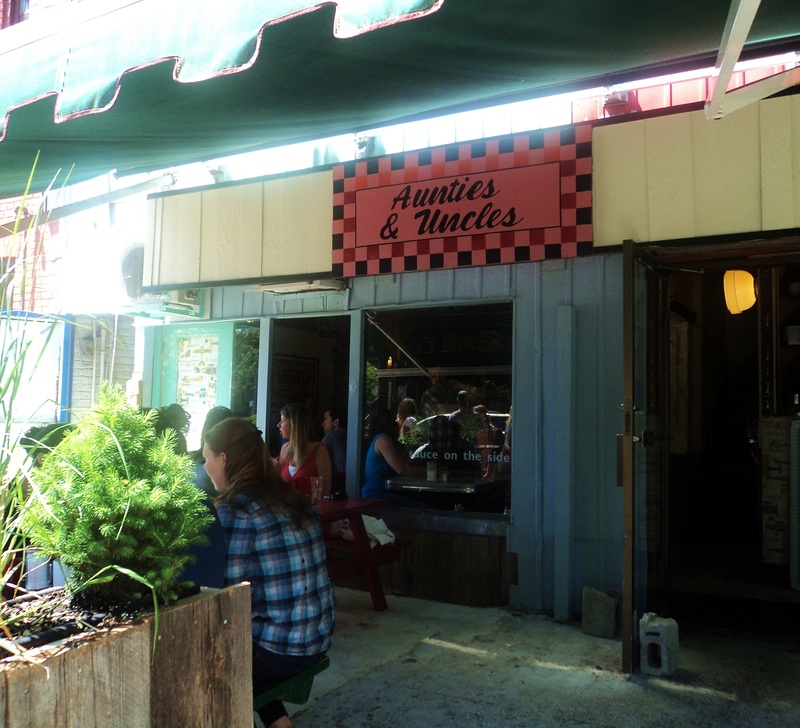 I’ve been there for dinner and brunch and its fabulous! The brunch is a price fix menu with a million options for mains – and they are all delicious, and there is a Make your own Cesar Buffet. The Manager (possibly owner) there is really really friendly too. Highly recommend! That sounds fabulous! I have been spending a lot of time in the Leslieville area lately and this place sounds great. I shall review it next. :) Thank you so much for the recommendation!